Layan Laser and Skin Center provides CoolSculpting services in Rancho Cucamonga, California. CoolSculpting is the number one noninvasive fat reduction procedure with over 5 million treatments completed worldwide. Dr. Munir and staff offer an individualized treatment plan for the best possible outcome as this treatment is highly operator dependent. CoolSculpting is an FDA-cleared method of non-surgical fat reduction that removes excess fat in certain areas. This method is non-invasive and is a safer alternative to surgical procedures for fat reduction. What is CoolSculpting used for? CoolSculpting is used to eliminate stubborn fat in problem areas, including the abdomen, ﬂanks, bra area, back, arms, outer hips, inner and distal thighs, and double chin fat. Dr. Munir provides patients with an evaluation to see which areas of the body will provide the most desirable outcome. Dr. Munir consults with each patient in order to determine if they’re a suitable candidate for CoolSculpting. Those who are considered good candidates are patients who want to eliminate stubborn fat through a non-surgical method. Patients with certain conditions, including cold agglutinin disease and cryoglobulinemia, should not have CoolSculpting done. Many patients find it impossible to lose stubborn fat in certain areas of their body no matter how hard they try. Thanks to CoolSculpting, there is now a non-invasive solution to banishing stubborn body fat for good. CoolSculpting works by freezing the fat cells located in specific parts of the body that are difficult to target with diet and exercise alone. Unlike other cosmetic solutions, CoolSculpting does not require any surgery or anesthetic. It is also far less risky than surgical procedures like liposuction. During a CoolSculpting procedure, freezing temperatures are used to break down fat cells while causing no harm to your skin or any underlying tissue. A CoolSculpting procedure can take less than an hour to complete and there is essentially no downtime. Most patients are able to return to their normal activities immediately after their procedure. Some patients do report a degree of soreness after a CoolSculpting session, however, this is typically no different than what you would experience after a heavy workout. After a CoolSculpting procedure is complete, the treated fat cell will exit the body over the course of 4-6 months. During that time, patients can expect a reduction of about 20 percent body fat in the treated area. These fat cells will never return, however, that does not mean results will necessarily be permanent. Because there are many more fat cells throughout the body, patients should strive to maintain a healthy weight after their CoolSculpting procedure to ensure long-term results. Is CoolSculpting Right for You? CoolSculpting has an incredibly high success rate and has helped thousands of patients banish body fat in areas that have given them trouble for years. This non-invasive procedure has very few side effects, making it a great option for many patients looking to remove stubborn body fat. Your doctor will speak to you about your particular case and whether or not CoolSculpting is the right solution for you. If you’ve struggled with stubborn body fat in certain areas for too long, take the next step to get the body you’ve always wanted. Contact us today to book your consultation. The CoolSculpting procedure is designed for people who want to eliminate fat bulges in specific areas. The CoolSculpting procedure is not a weight loss solution (unlike weight loss surgery, such as gastric bypass). People who choose CoolSculpting often want a non-surgical alternative to liposuction. Good candidates for the CoolSculpting procedure have noticeable fat bulges in certain areas. 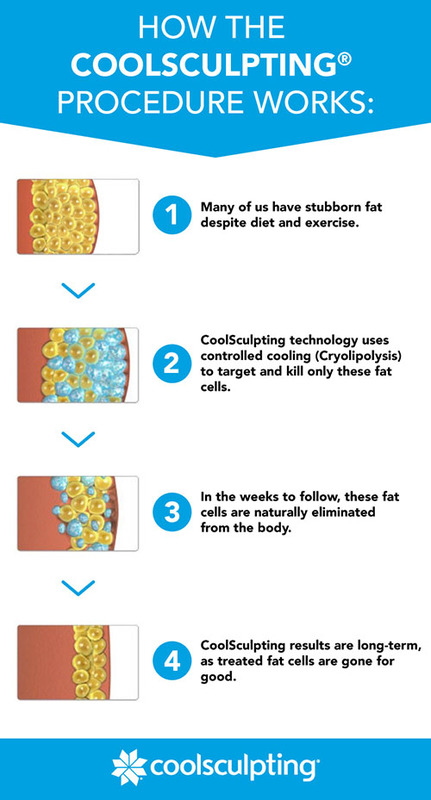 CoolSculpting uses a freezing method that targets fat cells just below the surface of the skin. These cells become damaged and are processed and eliminated from the body via natural methods. This results in a permanent loss of these fat cells, which don’t regenerate or grow again. During a CoolSculpting treatment session, which typically lasts between 35 and 60 minutes, patients can expect to feel a cold sensation at first. This usually only lasts for a few minutes. After this, the applicator used to freeze fat cells shouldn’t cause any discomfort. In fact, the targeted areas typically become numb during treatment. Some patients experience tingling in the treated areas afterwards, but this is only temporary as feeling returns. CoolSculpting has received FDA clearance as a fat reduction method for fat bulges in certain parts of the body. These include the flanks, abdominal area, thighs and under the neck for double chins. Since CoolSculpting doesn’t involve using an invasive technique, patients are able to return to their normal activities following their treatment session. Patients should note that there are potential side effects, such as bruising, swelling and temporary redness in the treated areas. Some patients also experience cramping or stinging in the treated areas, but this is generally mild and doesn’t last long. Additionally, CoolSculpting providers are licensed medical professionals with special training & certification to ensure your safety. CoolSculpting systems have built-in safety features to stop the cooling if sensors detect that skin becomes too cold. Please schedule a consultation with Dr. Munir if you have any questions about these procedures. 4Where Does The Fat Go? The frozen fat cells become crystallized, then die. The dead fat cells then are naturally processed and eliminated by your body. Some patients wonder if the results are permanent. CoolSculpting results are long term because those fat cells, and that fat bulge, are gone for good. 5When Will I See Results? You may start seeing changes in your body as quickly as 3 weeks after your treatment. The most dramatic results are usually visible after 2 months. Several months after your treatment, your body will still continue to flush out fat cells. After your CoolSculpting treatment, no special supplements are required. You won’t need to change any of your lifestyle habits because it’s not a diet and exercise program. Many people do feel more motivated to take good care of themselves after a CoolSculpting treatment. They look better, they feel better, and they want to keep their reshaped body healthy. ARE YOU READY TO GET BACK YOUR BODY'S YOUTHFULNESS?